Chances of quad aces against royal flush? The first player needs pocket aces. So of the 52 cards, we have 4 outs, we need 2, and we are drawing 2 cards. For the second player, first he needs any one of the KQJT that is not the same suit of the other players hole cards. 50 cards left, there are 8 outs in the deck, we are drawing 1 card and we need 1 of the outs. For the other hole card , we need one of the remaining KQJT of the same suit. 49 cards left, there are 3 outs, we are drawing 1 and need 1. On the board (don't care what order or where), we need exactly 4 outs from the 5 cards: the other two aces, and the other two cards KQJT of the same suit. 48 cards left, drawing 5, 4 outs, we need all 4. Answer, this happens in 877,963,124:1, or 0.000001139% of the time. I think they came up with 2.x billion? I'm curious how they figured it. That is assuming myWebView is your UIWebView object. 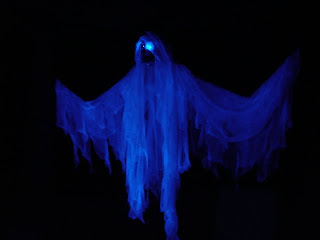 I put up my first Flying Crank Ghost for Halloween. Here it is. I also posted a video. I've been dabbling around in Objective-C lately, and I thought I'd share some of my experiences with it. It took some time to get my head around a lot of the basic programming syntax. I thought I'd share some things I've learned, and how it compares to PHP. First and foremost, Objective-C is a compiled language, whereas PHP is a scripted language. Objective-C requires compiling into a binary before it is executed. There is no need to compile PHP, as the script is interpreted at run-time. PHP was once strictly a procedural language, but over time many object-oriented language features have been added. Objective-C is an Object-Oriented programming language structure that is built on top of C, which is a procedural language. You can freely mix C with Objective-C (as well as C++), much the same that you can mix PHP procedural functions with PHP objects and classes. Objective-C is foremost an Object-Oriented language. That means, everything is an object. Even a simple string is an object of NSString. And yes, you can mix C code and use plain procedural functions if you wish. Normally you can do everything you need with objects. First, a "Hello World" application in PHP, then the same one in Objective-C. If you have had any experience programming in C, much of this will look familiar. Objective-C is after all, just an extension of the C programming language, adding in all the OO goodness of Objective-C to the already existing C syntax. I'm going to refer to Objective-C as OC from here on out. #import is much the same as include_once() in PHP. If a file gets imported more than once, it is ignored. OC is made up of header files (.h) and source files (.m) Typically, each header file is paired with a source file. The header file declares the instance variables and methods of your classes, whereas the methods are implemented in the source (.m) file. You need only import the .h file, as the .m file is compiled by XCode automatically. The @interface line describes the name of your class, and also describes what object it is inherited from. Here we have a class named "HelloWorld" and it inherits NSObject, which is the most basic of objects. It is the top object of the inheritance tree. In PHP, there is no need to declare what object an non-extended class is inherited from. In the curly braces of the @interface line, you declare what instance variables your class will contain. In our example, we have none declared. After the curly brace and before the @end symbol, you declare your class methods, and the arguments they may take. The minus "-" at the beginning of the line declares that this is an instance method. If it began with a "+" it would be a class method. In PHP the "+" methods would be referred to as static methods. That is, a method called directly from the class, not from an object instance. (void) is the value that is returned from the method. This method does not return a value. @end defines the end of the method declarations. We import our HelloWorld.h header file. Between the @implementation and @end lines, we implement the methods of our class. This is an instance method, denoted by the "-" at the beginning. A "+" would have denoted a class method, or "static" method in PHP jargon. This method does not return anything, so (void) is used as the return declaration. This is the body of our method. NSLog is the OC equivalent to the PHP's and C's printf function. %@ is a placeholder for our string object. NSCalendarDate is a class from the Foundation.h framework, and we are calling the calendarDate method of the class. It will return a string object containing a date for our NSLog. This marks the end of our implementation methods. Here we import our Foundation.h file. (Note we could have left this out, since the HelloWorld.h file imports it already.) Then we import the header file of our HelloWorld class. As in C, every OC program must have a main() function. This is where the compiled binary will begin its execution, passing in any arguments given from the command line. In PHP, arguments to a script are captured in the $argv variable. This is part of the memory management of OC. Every object in OC retains a count of how many references are attached to it. When an object is first instantiated, a reference count of 1 is placed on the object. Each time the object is retained, its reference count is incremented. Each time it is released, it is decremented. Once the ref count reaches zero, the object is destroyed. The autorelease pool is an OC convention used for memory management. When you autorelease an object (as opposed to just releasing it), it gets added to the pool of objects to be released at a later time. This way if something else needs to pick up your object before it is destroyed, it can, and you don't have to remember to release it again. OC 2.0 also has garbage collection features that help automate the tedious task of memory management. In PHP, memory management is automagically handled for you. This is where your object is instantiated. [HelloWorld alloc] means we are calling the static method "alloc" of the HelloWorld class (a special method available to all OC classes.) alloc does the memory allocation for your object. Then, the init method is called of the instantiated object. This is much like the __construct() method of PHP objects, where initialization is handled, as well as initialization of any superclasses. The object is then given a pointer (of type HelloWorld) named *hw. Now we reference our object with hw from here onward. Note that in OC all objects require pointers to reference them. This is where we call the printHelloDate method of our class. In OC jargon, they call this a "message". I don't know exactly why, it's just calling a method of the object. When you see [object message] in OC, that is exactly what it is. The object is on the left, the message (method name) is on the right. Here you see exactly what the parameters are for. In PHP I may have guessed that the first two params were X and Y, but the third would be a mystery without digging into the class. In OC, I can plainly see the first arg is X, the second is Y, and the third is setting the visiblity. Also in OC, you will typically see YES and NO used for booleans, not true and false. One other tidbit: in Objective-C, the parameter names are part of the method name. So in PHP, the above method name is setSize(), whereas in Objective-C, the method name is setX:Y:visible. And here we are releasing the autorelease pool, which will inevitably clean up our object from memory. Our main function is expecting an integer to be returned, so we'll return a zero. That's about it. If there are errors, send me a comment and I'll get them corrected. Thanks! Once that is in place, pull up the volume controls in XP (double click the speaker in the system tray), go to options->properties, check the "Line In" option. This enables line-in and places the input controls on your volume control panel. Now adjust your line-in volume. I left mine all the way up. That's it, your sound card should pass the line-in sound through to your line-out. Some instructions I found online say to get a Y-splitter and run both computers line-out to the speakers. Not only can this create unwanted line-noise, but you can easily damage the sound cards of your computers. Passing the sound through one of the computers is the safest way to go, and only requires one cable. It's been awhile since I've played some live poker, but I went to the casino an hour up the road over the weekend. I turned $100 into $850 at the $1-3 NL table in about six hours. Not bad! Although I'll have to admit, there were some frustrated people at the table, and I'll tell you why. To several of the players, I seemingly played junk cards most of the time, and took down some very large pots with them. I can see how this can be frustrating when you have solid preflop cards, raise with them, get called and get taken by a lucky flop. But there is a method to the madness, and I'll try to explain. First of all, I like to show down a big bluff somewhere in the beginning of my game. I'll raise preflop with junk, bet the flop, bet the turn, bet the river and turn up next to nothing. Now they have a perception of a loose foolish player at the table. It works even better if I get lucky and hit two pair or something. I just make sure my betting made no sense. I'll do this now and then, especially if the table is changing players often. I like to keep the loose image. This helps my strong hands make more, and also keeps them guessing. Now, in my observation of the game of No-Limit (especially at these smaller stakes,) cards like pocket aces or pocket kings will typically win a small pot or lose a large one. On the other hand, cards like small suited connectors, small pairs, small one gappers are the opposite: they will typically lose a small pot, or win a large one. One reason is the difference in starting strength of the hand. If pocket aces gets no help on the flop, it's going to be hard to fold that hand in any event. Whereas something like 56, if the flop isn't strong, it's an easy fold. Another is deception. You call preflop with 56 and the flop comes 56T rainbow, the aces aren't going to be too concerned about losing with that texture of a flop and they'll likely pay you off nicely. Whereas the flop comes 9TJ, the aces will be a bit more cautious if they get re-raised. Holding small cards, the flop that helps you is not likely going to be helping another player in the hand. When you call a preflop raise, you are typically going to be up against stronger starting hands, and that helps when you hit the flop right. You don't have to guess if you have 2nd best, such as a hand like TJ might be doing with a flop of TJQ. If you are going to try playing this style, remember implied odds, that is the most important thing. That is, if you are going to call a preflop raise with little cards, make sure you have a bankroll to back it up, as well as the guy you are calling. You want sufficient implied odds so when you hit the flop, you get paid off. This is a follow-up to my blog post about KENO playing. There are many misconceptions about how slot machines work, and I'd like to clear them up. Some people that play slots tend to think a slot machine is "hot", or "due to hit soon" because it hasn't hit in awhile. Hopefully I can make it clear why that isn't so. Firstly, a slot machine works on pure probability. Every spin has the same chance to win. Let's say we have a slot machine that has a 100,000 in 1 chance to hit the jackpot. That means that every time you spin the reels, you have a 100,000 in 1 chance of hitting the jackpot. So what happens if you spin the reels exactly 100,000 times in a row? Will the jackpot hit once somewhere in those spins? The odds predict this, but it's not necessarily so. It might hit once, or it might not hit at all. Or, it might hit several times. You might hit two in a row! Or it might go a million pulls in a row without ever hitting one jackpot. Since every pull has an equal chance to win, they are completely independent of each other. That means, if the slot hasn't hit in 90,000 consecutive spins, that does NOT mean it has 10,000 spins left before the jackpot hits. The last 90,000 spins have zero influence on what is yet to come. You can pretty much figure that any time you sit down at this slot machine, it will probably hit the jackpot sometime in the next 100,000 spins, regardless of what has happened in the past. If you are playing on a slot machine with a progressive jackpot, you can keep a rough estimate on how long it has been since it hit. The higher the progressive, the longer it has been since the last time it hit. But, your odds of winning never change. Whether the jackpot just hit, or it has been a year since it hit, your chances of winning on each spin of the reel are exactly the same. Some say they've never seen a jackpot hit early, but it does hit a very short time after the progressive gets very big. Why is that? Well, if the jackpot hit very early, you probably wouldn't even notice. Say the jackpot hits and starts over at $1,000. You come back a week later at the jackpot has progressed to $1800. What you don't realize is that the jackpot may have hit again at $1200 and reset to $1000, then climbed it's way back to $1800. When the jackpot hits early, you can't really see any consequences of it. So why does it seem to hit soon after it gets very big? It's a matter of sheer numbers: the more spins that happen, the more chances there are to hit the jackpot. Every single spin of the reels still has a 100,000 to 1 chance to hit, but if the slot gets a whopping 100,000 spins in one week, it is likely that the jackpot will hit sometime during that week. But again, it might not hit at all, or might hit several times in that week. After the jackpot is hit, the volume of spins will most certainly die down to a trickle again, at least until it builds up again. Now you might be inclined to play the slot machine with the big progressive, and that makes sense: if you are lucky enough to hit the jackpot, it pays out better than a machine that hit recently with low progressive. But your odds of winning are no different than playing a slot machine that hit one minute ago. This logic can be carried over to the roulette wheel. Casino's have started posting the recent numbers that have hit. But, those numbers have zero influence on future spins of the reel. You can play the same number all night, or switch numbers every spin, it really doesn't matter. Keno is very much the same. The numbers that have hit recently have no influence on the upcoming numbers. You can play the same numbers all night, or switch numbers every ticket. It doesn't make a bit of difference in your chances to win.